The Musso may be cheap, but sadly, it’s far from cheerful. Even if we gloss over the rather utilitarian cabin, we’d still struggle to forgive the Musso’s fundamental deficiencies in the key areas of comfort, refinement and general driveability. Constantly restless, incessantly noisy, with excessive body roll and devoid of steering connection, it’s an extremely taxing vehicle to drive even at a sedate pace. While the bargain price point and unlimited mileage warranty have some merit, you’ll need an awfully strong constitution to rack up high mileages in the Musso. Those of you with long enough memories will probably remember the original Musso and how it definitely looked more like an SUV than a pick-up truck. 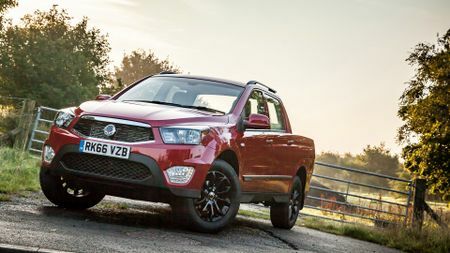 While the Korando and Rexton models have now taken on SsangYong’s SUV mantle, the Musso has morphed into a simple, no-frills double-cab pick-up truck. On sale from what seems like a ludicrously low £15,995 exc. VAT, the EX auto model tested here commands a £3,000 premium over the base car, although £1,000 of that is down to the automatic gearbox. The remaining £2k gives you climate control, cruise control, leather heated front seats, automatic lights and wipers, folding door mirrors and a 7-inch touchscreen – all items that the base car foregoes. 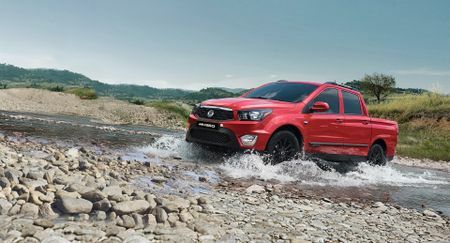 Fitted with a 2.2-litre 176bhp four-cylinder diesel engine linked to a four-wheel drive system, the 4X4 end of things can be switched between two- and four-wheel-drive, and from high to low high ratios while on the move, via a dash mounted dial. The Musso also offers a five-year, unlimited mileage warranty, so even if you use it to lump cement from one end of the country to the other, all-day every-day, the mechanical components will still be covered for half a decade. Staying with the practical aspects, the Musso’s load bed is big enough to take a standard Euro pallet, and it comes with a sturdy plastic deck liner and tie down points. But if you’d rather your rear-end were covered, a hard-top with full glazing, a heated rear window and body-colour paintwork is available for £1,670. 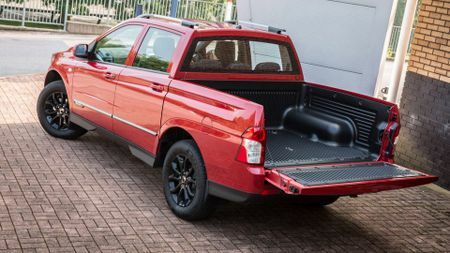 Like most pick-ups, the Musso sits on a robust ladder frame chassis, which enables it to carry a 1-tonne payload and tow up to 3-tonnes – although not simultaneously. Surprisingly, rather than using basic cart-like leaf springs similar to those that underpin most of its rivals, the Musso’s rear-end is fitted with multi-link suspension components and coil springs. This set-up should provide a reasonably comfortable ride. Well, that’s the theory, anyway. When it comes to commercial vehicles, you need to rein in your expectations regarding civility and comfort. After all, we’re talking work horse here, not show pony. Even with this caveat applied though, the Musso still manages to surprise. And not in a good way. While wind and road noise are both highly intrusive – has someone left a window open? – they pale into insignificance when compared to the Musso’s fundamental lack of comfort. Most pick-ups are heavily sprung to cope with heavy loads, so they feel too stiff when driven unladen. The Musso is no exception, but it doesn’t stop there. Because the body lacks fundamental rigidity, it also feels incredibly wallowy. So much so, you’d swear its suspension were tied to its body using bungee straps. The slightest bump in the road sends a huge bout of collywobbles coursing throughout the length and breadth of the cabin, while simultaneously sending the steering column squirming and gyrating like a samba dancer on acid. Unsurprisingly, for a vehicle designed to go off-road, the steering is pretty darn slow: the steering wheel needs a full three and a half turns from lock-to-lock, but it’s also very reluctant to return to centre. With this in mind, you can probably imagine how frantically you need to shuffle the wheel to release the lock and get everything heading back in a straight line when pulling out of a T-junction. Give the wheel a big tug when entering a corner, and there’s a delay which would impress a London commuter. First, the Musso rolls left, before eventually getting the message and heading in the direction you pointed it in. These delayed reactions also make it difficult to plot an accurate path on a winding country road at anything above Driving Miss Daisy speeds. At least the 2.2-litre diesel engine is pretty perky, and it’s also reasonably smooth – as long as you don’t rev it over 3,500rpm. Work it beyond this point and there’s a stepped increase in mechanical combustion racket and a distinct tail-off in performance. The automatic gearbox is no great shakes either, as there’s a pronounced delay between each change, and the shifts are rather abrupt. You can improve matters by using the manual override switch on the side of the gear lever to force the changes, but this somewhat defeats the object of buying an automatic. Unlike a lot of rivals who offer single- or double-cab options, the Musso is only available as a four door, and although legroom in the rear is not particularly extravagant, a trio of burly blokes should still have sufficient elbow room to thumb through copies of the Currant Bun. It’s perhaps a bit unfair to criticise the materials used in the Musso’s cabin, because after all, this is a working vehicle that needs to resist muddy Doc Martins on the dashboard, along with the general abuse your wrecking crew will dish out on a daily basis. To this end, things feel pretty robust. 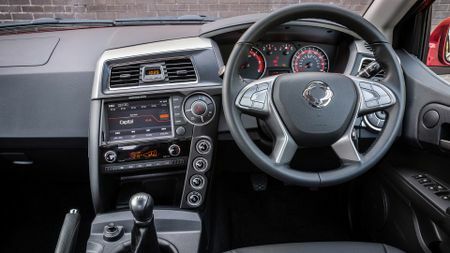 While the dash is about as complicated as a knife and fork, shiny black highlights on many of the controls, and a touch of leather on the steering wheel, along with large light flooding windows, do their best to lift the general interior ambience. That’s a real toughie. 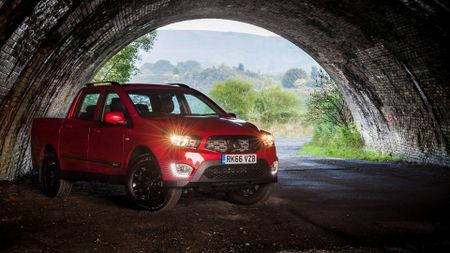 If price is everything and you definitely need a new pick up – whether it be for tax reasons or maybe you simply can’t countenance the thought of buying a used truck – then it might be worth a punt on the entry model Musso. 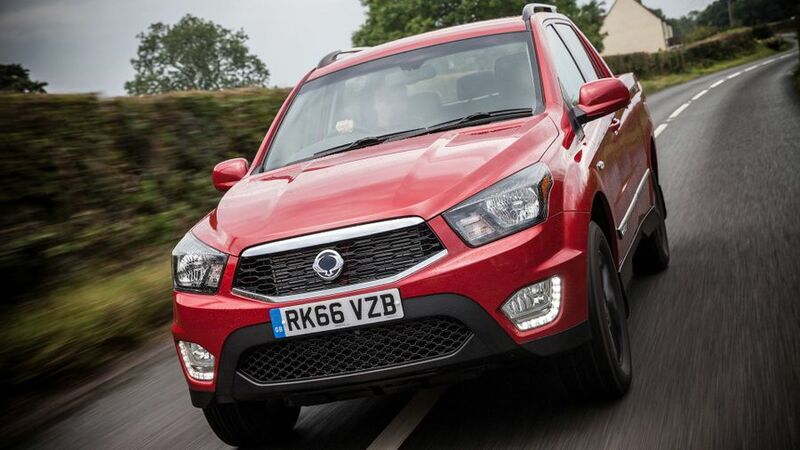 At least you’ll sleep soundly, safe in the knowledge that if anything goes awry, you’d be covered by SsangYong’s exceptional warranty. However, spending more on the higher spec cars to gain creature comforts and the dubious benefits of a lacklustre automatic gearbox seems like folly to us. Ford’s high end pick-up provides strong performance, a smartly trimmed cabin, SUV-like infotainment systems, active safety functions and fuel-efficient diesel engines. The L200 is one of the best, with a host of class-leading qualities. It looks the part, and offers great value, as well as a genuinely car-like experience and company car tax benefits. 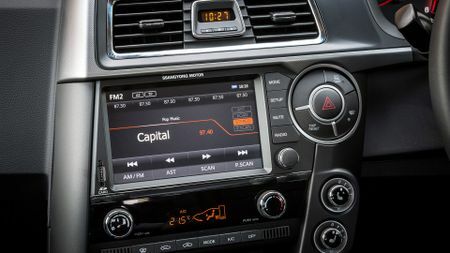 The Navara is designed to appeal to commercial and leisure users alike. With this kind of duality in its locker, it makes all other pick-ups seem like antiquated one-trick-ponies.